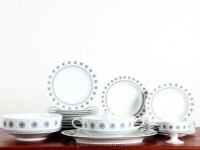 Rosenthal is a german company with history over 125 years long. Its brands with innovative design for the well-laid table, for furniture and for giftware are available in 97 countries around the globe. In 1891 company starts to manufacture its own porcelain and the shape »Empire« is one of the first complete service-sets. In 1972 acquisition of the factory Espelkamp is the beginning to the furniture production branded Rosenthal Einrichtung.Today Rosenthal stands for luxury, lifestyle and a special aestehetic feeling.